Engagement through design: Your website serves as a business card, a brochure, a point of sale, and a customer service representative. A well designed website will keep the user engaged while keeping all requested information within three mouse clicks from anywhere within the website itself. Multilingual support: Your customers can come from any geography, and you need to speak their language. 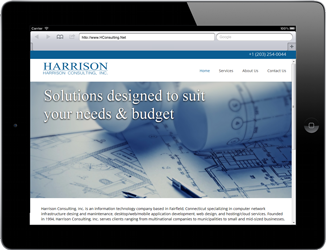 Harrison Consulting can help with that too. We build support for multiple languages directly into our websites as to appeal to a wide an audience as possible. We even offer translation services for Russian, Spanish, French, Italian, Romanian and Greek. SEO: You want your business’ listing to occupy the highest possible rank in search engine results, a task that has been complicated by rapid updates to Google’s Panda algorithm and the introduction of real-time bidding. 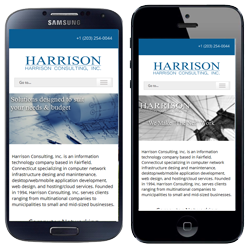 At Harrison Consulting, we recognize that search engine optimization is as much art as science. By improving your search engine ranking we increase your traffic, and help convert additional traffic into revenue.